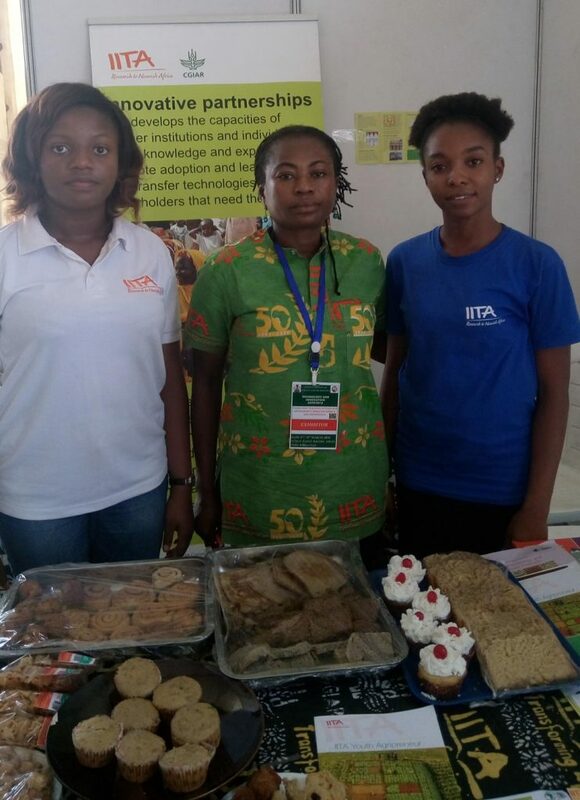 IITA made a strong appearance at the week-long “Technology and Innovation Expo 2018” that took place in Abuja, 5-9 March. The IITA stand featured publications, vine cutting technology, and several cassava and yam-based confectionery including the landmark “Tidbits.” From the first to the last day of the event, visitors thronged to see IITA’s featured technologies and innovations, which some described as “unique.” Several high-profile visitors toured IITA’s exhibition stand, including directors, scientists, diplomats, and a high-powered delegation from the Nigerian Army. The annual expo is organized by the Federal Ministry of Science and Technology and the theme of this year’s expo was “Fast-tracking sustainable development of Nigeria through science and technology.” It was held at Eagles Square, Abuja, with IITA attending for the second consecutive year. At the closing ceremony on 9 March, IITA was given a certificate of participation, which was received by Terngu Abur, Communication and Marketing Assistant based in Abuja, on behalf of IITA. Outstanding innovation was rewarded as the Federal Government pledged to sponsor the best three candidates that sat for the 774 Young Nigerian Scientists Presidential Award scholarships up to doctorate degree in any Nigerian university. President Buhari, who was represented by Vice President, Prof Yemi Osinbajo, said that the move aims to encourage more young students to study science. “I am confident that this expo will build on the achievements of others before it,” the host, the Honorable Minister of Science and Technology, Dr Ogbonnaya Onu said. The dignitaries at the event included top government functionaries, diplomats, and private sector captains.